In this post, we will look into some new findings from the field of ancient DNA which are relevant to the question of the Indo-European homeland. In this first part, we will mostly focus on the genetic aspect, and in the second part (soon to come), we will look at how this can best be correlated with linguistic arguments. The field of ancient genomics has contributed greatly to the discussion of prehistoric migrations and with that also the discussion of the Indo-European homeland. 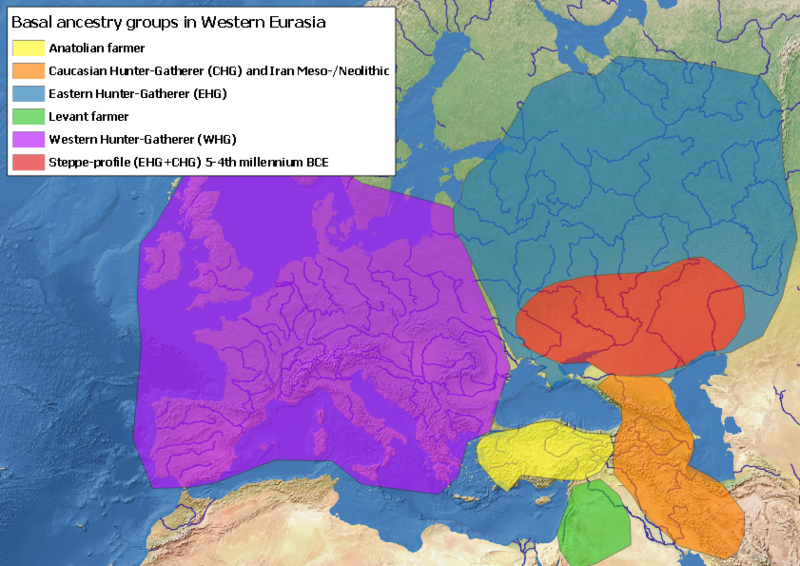 – Eastern Hunter-Gatherers (EHG) found in most of Russia and Eastern Europe (including the Pontic-Caspian steppes). – Western Hunter-Gatherers (WHG) found all over the European peninsula going back to the Paleolithic. – Caucasian Hunter-Gatherers (CHG) and Mesolithic and Neolithic Iranians which seem to be closely related. – Anatolian Farmers responsible for the spread of agriculture in most of Europe. – Levant Farmers going back to the Natufians who are known as the earliest farmers in the Levant. Approximate distribution of basal ancestry groups in Western Eurasia about 10,000 years ago and the later Steppe profile added in red (by Mikkel Nørtoft). In 2015, two large (and competing) studies appeared with improved methods looking at the whole genome instead of the earlier methods only using the Y-chromosome (inherited from the father, only in males) or mitochondrial genome (inherited from the mother). Together, they had sampled more than a hundred ancient humans from various periods and regions in western Eurasia. They reached the same conclusion using two different methods of analysing ancient DNA: the individuals of the archaeological culture termed Yamnaya (or “Pit Grave”) (c. 3300-2800 BCE), and the preceding Khvalynsk culture (5th millennium BCE), both living in the Pontic-Caspian steppes, were genetically closely related to the widespread European Corded Ware culture complex (c. 2900-2200 BCE). They went as far as suggesting a “mass migration” of Yamnaya herders into Europe around 3000-2500 BCE. The Yamnaya genomes were also very close to those of the Afanasievo culture appearing in the Altai region of Siberia around 3300-3100 BCE. The male Y-chromosome haplogroups R1a and R1b spread together with these steppe-populations into Europe and Asia and are still today very frequent in most of Europe. It thus seemed that an exodus of herders moving both east and west from the Pontic-Caspian steppes had now been found in the DNA. Yamnaya individuals in the Pontic-Caspian steppes also derived about half of their ancestry from earlier local Eastern Hunter-Gatherers (EHG), and about half from the Caucasus region (Caucasian Hunter-Gatherers). This Caucasian ancestry is about 25% in earlier steppe Khvalynsk individuals (5th millennium BCE). This seems to fit archaeological studies that show movement of material culture from the North Caucasian Maykop and Novosvobodnaya cultures into the steppes during the 4th millennium BCE. The cultural-material evidence of influence from the Caucasus before the 4th millennium BCE is more subtle. It has now been confirmed that the two ancestry groups do not seem to share deep genetic ancestry. Only from the Yamnaya period (3rd millennium BCE), we see the significant steppe ancestry moving south into the Caucasus region. However, there are a few so-called “outlier” individuals on both sides of this frontier who belong to the other genetic group. This scenario fits the model of cultural contacts between the two groups through small scale movement. Y-chromosome haplogroup J2 (carried by males) is very common in the Caucasian group. Since this haplogroup only rarely shows up in steppe-related individuals, also after the spread of steppe groups, it could indicate that mostly females “switched sides” in a system of patrilocal intermarriage (females move to the husband’s family), perhaps through marriage alliances, or at least that Caucasian male lineages were not very succesful in the steppes. We also see these moving “female brides” in Europe with the arrival of (mostly male) Yamnaya populations forming the Corded Ware phenomenon. This model is further supported by the Caucasian ancestry in the steppes only increasing quite slowly, first to about 25% in the Khvalynsk period (5th millennium BCE), and then to about 50% in the Yamnaya period (late 4th millennium BCE). Additionally, it should be noted that some minor ancestry in Yamnaya individuals from European Farmers and Western Hunter-Gatherers has also been found recently. This supports archaeological contacts between steppe societies and European farming societies like the Cucuteni-Tripolye town dwellers in Ukraine and Bulgaria and/or the East European Globular Amphora culture where this type of ancestry has been found mixed with European Western-Hunter Gatherer ancestry. In the next post, we will look into the implications of these genetic findings on the question of the Indo-European homeland. Allentoft, M. E. et al. 2015. Population genomics of Bronze Age Eurasia. Nature 522, 167–172. Fu, Q. et al. The genetic history of Ice Age Europe. Nature 534, 200–205. Haak, W. et al. 2015. Massive migration from the steppe was a source for Indo-European languages in Europe. Nature 522, 207–211. Jones, E. R. et al. 2015. Upper Palaeolithic genomes reveal deep roots of modern Eurasians. Nat. Commun. 6, 8912 (2015). Lazaridis, I. et al. 2016. Genomic insights into the origin of farming in the ancient Near East. Nature 536, 419–424. Wang, C.-C. et al. 2018. The genetic prehistory of the Greater Caucasus (preprint). BioRXiv 16 May. The question of where and when Proto-Indo-European was spoken is often termed “the Indo-European homeland problem” and is closely related to the important follow-up questions “how and when did the languages spread”. If the members of this one language family have been so successful compared to other language families, and were already very widespread (from Tocharian in Western China and Sanskrit in India to Old Irish in Ireland, and Old Icelandic in Iceland) when they first appeared in written form, we would expect their initial spread to be somehow visible in the archaeological remains of prehistoric cultures. But of course spoken language normally flows elusively through the air and is not materialised unless written down, so the language spread could, in theory, be completely invisible, and determining a homeland would be close to impossible. Nevertheless, many hypotheses about the Indo-European homeland have been put forward, but they were often “polluted” by nationalism (mostly placing the homeland in whichever writing scholar’s own country). The concept of Indo-Europeans was even taken hostage in the agenda of the Nazi regime, referring to them as “Aryans”. However, the term Aryan is actually a religious, cultural, and linguistic, but not racial(! ), self-designation found in early Indic (Vedic) texts. This “hijack” by the Nazis has unfortunately tainted the topic of Indo-European studies to the public ever since. This does not, however, make the original homeland question any less relevant. 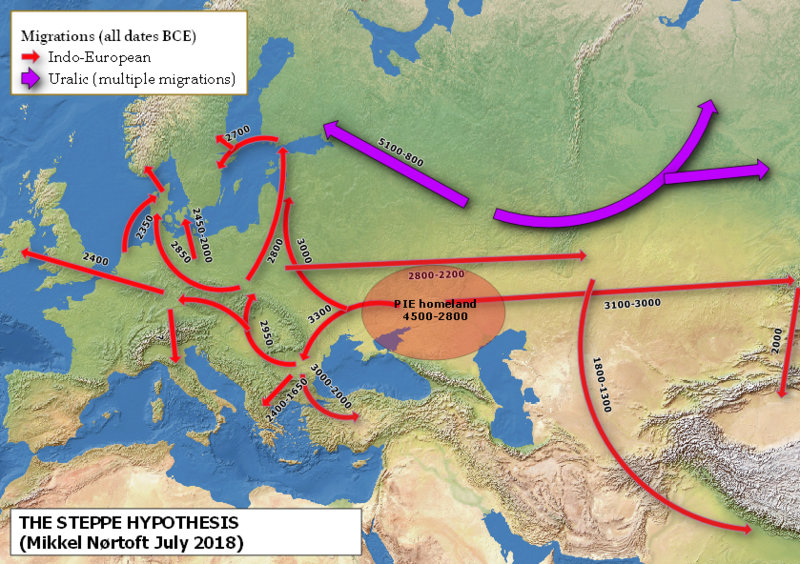 (2) The “Pontic-Caspian steppe hypothesis”: the early speakers of Indo-European spread with herders from the grassland steppes north of, and between, the Black (“Pontic”) Sea and the Caspian Sea around 4000–3000 BCE. 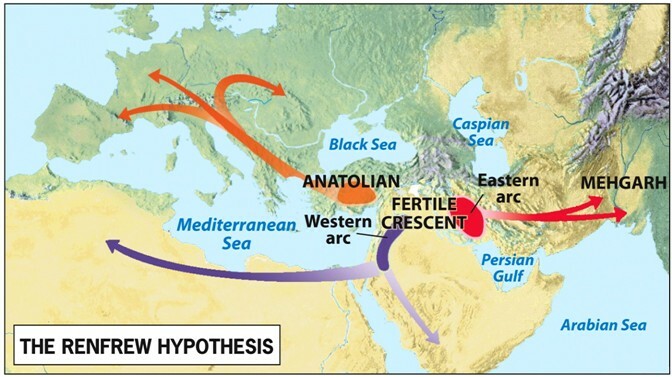 The “Anatolian hypothesis” has been dominant in most of western archaeology by Colin Renfrew, and the “Steppe hypothesis” has been dominant in most historical linguistic circles and in East European archaeology by Marija Gimbutas, and later elaborated and improved by James Mallory and David Anthony. The technological principle: What technological vocabulary can be securely reconstructed for PIE, and how does that match the material culture we are looking for archaeologically? Some important examples in PIE are terminology for wheels and wagons (including ‘axle’), weaving, wool, and dairy product terminology. Therefore we must expect the Indo-Europeans to have had these things at the time of PIE, or at least “Core PIE” (after the Anatolian branch split off). Interestingly, we have difficulty securely reconstructing agricultural terminology for PIE, which suggests that it was not very important in their society. Generally, it has been argued that the PIE vocabulary suggests that we should be looking for a patriarchal herding culture. If we look at the archaeological evidence for these things we find evidence of a herding culture in the Pontic-Caspian Steppes (many domestic animal bones from c. 5200 BCE onwards), evidence for wheels from around 3500 BCE, evidence for the use of milk in pots from the mid 4th millennium BCE, and evidence for weaving (woven reed mats on ceramic imprints) from Khvalynsk on the Volga, probably around 4000 BCE. However, no evidence of wool has been found in the steppes until the Catacomb period c. 2500 BCE; but since wool is very rarely preserved anywhere, this is not a strong argument against the presence of wool (more on this in a later blog post). The best indication of wool in the steppes is a few wool textiles in Novosvobodnaya in the North Caucasus (neighbouring the steppes) C14-dated to 2893–2679 BCE. The relational principle: Loanwords are often exchanged between related and unrelated languages. When we see this in prehistory, it is a strong indication of direct contact between languages. Knowing the chains of sound laws, different chronological layers of loanword exchange (and then contact) can also be established to some degree. We can even see that several loanwords were exchanged between some North Caucasian languages (still spoken in the Caucasus region) and PIE before the split. A few early loans from an ancestor of the Semitic language family (Hebrew, Arabic, etc. ), termed “Afro-Asiatic”, have also been proposed. One example is a word for ‘bull’, *tauros. Perhaps most important for the homeland question are the PIE loanwords borrowed into the common ancestor of the Uralic language family, which includes Finnish, Saami, Hungarian, and many minority languages in Russia. The Uralic “homeland” (equally debated) is by many scholars suggested to have been in the forest zone west of the Ural Mountains at the Volga–Oka (and perhaps also Kama) rivers, perhaps in the Volosovo culture (c. 3650–1900 BCE). These loanwords place PIE somewhere between the Uralic homeland (forests of Volga-Oka-(Kama)) and the Caucasus. Furthermore, many also argue for an even earlier unity between Uralic and Indo-European, termed Indo-Uralic. With all this in mind, a homeland in Anatolia would make it very difficult to explain the possible deep relationship between PIE and Proto-Uralic. The lack of good reconstructions for agricultural words, especially for pulses (including lentils, beans, chickpeas and peas) speaks for the “Steppe hypothesis”. They are not found archaeologically in the steppe region in the relevant period, but they are found as domesticates with the early farmers of Anatolia from around 7000 BCE, and have been widespread in Europe ever since they arrived with early farmers from Anatolia. Therefore, it is unlikely that the Anatolian farmers spoke PIE, and it is yet another argument against the Anatolian hypothesis. In an upcoming post, we will look at the very new field of ancient DNA and its implications for the question of the Indo-European homeland. Anthony, David W. 2007. The horse, the wheel, and language. Princeton, NJ: Princeton University Press. Anthony, D. W., D. R. Brown & O. D. Mochalov (eds.). 2016. A Bronze Age landscape in the Russian steppes: The Samara Valley Project (Monumenta Archaeologica 37). Los Angeles: UCLA Cotsen Institute of Archaeology Press. Kallio, Petri 2015. The language contact situation in prehistoric Northeastern Europe. In: Robert Mailhammer, Theo Vennemann & Birgit Anette Olsen (eds.) The linguistic Roots of Europe: origin and development of European languages. Copenhagen: Museum Tusculanum Press. Kroonen, Guus. 2012. Non-Indo-European root nouns in Germanic: evidence in support of the Agricultural Substrate Hypothesis. In: Riho Grünthal & Petri Kallio (eds. ), A linguistic map of prehistoric Northern Europe (Suomalais-Ugrilaisen Seuran Toimituksia = Mémoires de La Société Finno-Ougrienne 266), 239–260. Helsinki: Société Finno-Ougrienne. Mallory, James P. 1989. In search of the Indo-Europeans: language, archaeology and myth. London: Thames and Hudson. Mallory, J.P. & Douglas Q. Adams 2006. The Oxford introduction to Proto-Indo-Indo-European and the Proto-Indo-European world. Oxford: Oxford University Press. Pontic Eneolithic and Bronze Age Societies. Star: Science & technology of archaeological research. Parpola, Asko. 2012. Formation of the Indo-European and Uralic (Finno-Ugric) language families in the light of archaeology: Revised and integrated ‘total’ correlations. In: Riho Grünthal & Petri Kallio (eds. ), A linguistic map of prehistoric Northern Europe (Suomalais-Ugrilaisen Seuran Toimituksia = Mémoires de La Société Finno-Ougrienne 266), 119–184. Helsinki: Société Finno-Ougrienne. Shishlina, Natalia I. (ed.). 1999. Tekstil’ èpoxi bronzy Evrazijskix stepej [Bronze Age textiles of the Eurasian steppe]. Moskva: Gos. istoricheskij muzej. Shishlina, Natalia I. et al. 2003. Bronze Age textiles from the North Caucasus: New evidence of fourth millennium BCE fibres and fabrics. Oxford Journal of Archaeology 22(4). 331–344. Shishlina, Natalia I. et al. 2009. Paleoecology, subsistence, and 14C chronology of the Eurasian Caspian Steppe Bronze Age. Radiocarbon 51(2). 481-499. Shishlina, Natalia I. et al. 2012. Isotopes, plants, and reservoir effects: Case study from the Caspian Steppe Bronze Age. Radiocarbon 54(3–4). 749–760. Shishlina, Natalia I. et al. 2018. Presentation at the conference “When archaeology meets linguistics and genetics” at the University of Gothenburg, 2–4 May 2018.